Right now we have a full October harvest moon and it seems to have really motivated the Rainbow Trout on the Little Red River. On Thursday we did a little fly fishing with our old friend, Paul Broddick, and the boys got hooked up to some really nice harvest moon Rainbows. 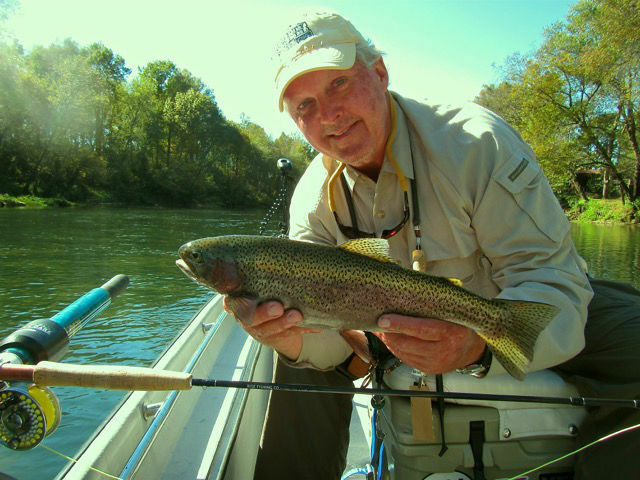 The first two hours were spent with streamer rods and a Chuck’s Chunk was the top streamer pattern bringing at least a dozen Rainbows to the net. As the sun got brighter on the water the switch was made to nymph rigs and a #20 Burple Zebra Midge as a dropper under a #16 Chronic was the set up that seemed to work best. Bo fished a 4wt. In-Stream 4wt. 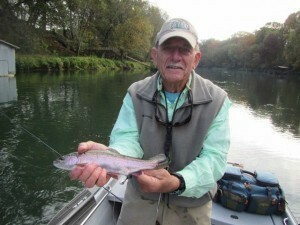 rod from Steve Berchard’s Rise Fishing Company and it has become our go-to guide rod. For more information on these super rods give us a call or better yet just book a trip with Empty Creel Fly Fishing Guides & Outfitter and try one out for yourself. The fall foliage on the river right now is just beautiful and it is shaping up to be wonderful fall season. Water conditions a super good and the fish are really active. There is some Rainbow spawning activity on the river but the Brown Trout have not yet even begin their pre-spawn activities. 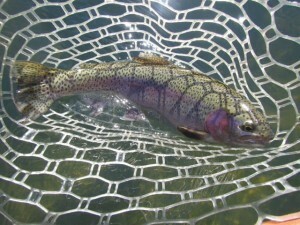 Just as a reminder, we do not guide over spawning fish and if you choose to fish over spawning fish please be careful not to wade in spawning beds and release all fish immediately. The Little Red River has the only completely wild population of Brown Trout in the state so please help take care of this very special natural resource!